If a Vienna Tourist Board survey is to be believed, as many as 23,737 Indians visited the city in the 12-month period ending June 23, 2013. Move over, overhyped Paris and soggy London, the Indian tourist has found the ultimate in European exotica. Billy Joel may have used Vienna as a metaphor in his iconic song by the same name, but for most Indians, the Austrian city does seem to be waiting for them. If a Vienna Tourist Board survey is to be believed, as many as 23,737 Indians visited the city in the 12-month period ending June 23 - signifying that the city of castles, palaces, gardens and museums is fast emerging as one of the hottest destinations for Indian tourists. While most of the tourists came from Delhi, Mumbai, Chennai, Kolkata and Bangalore, corporate travellers amounted for as much as 15 per cent of the visitors. 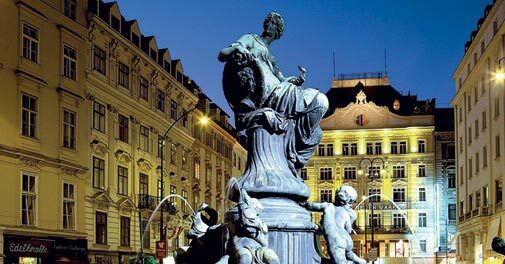 Located in the centre of Europe, Vienna is known to be one of the safest cities in the world. And what's more, the city is dotted with Indian restaurants - something that could certainly influence any desi tourist's decision to visit a country. The other cities in the region that Indians tend to visit are Budapest and Prague, Vienna tourism officials said. 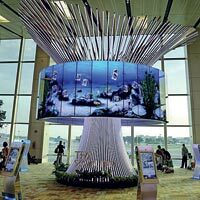 Visit the Changi Airport at Singapore, and you are unlikely to forget the experience anytime soon. And now, with the Social Tree - a new attraction that blends avant-garde design with interactive technology - the airport ensures that it doesn't forget you either. Close to nine metres tall and taking pride of place at the heart of Terminal 1, the tree is made up of 64 giant high-definition screens that offer a 360-degree display of various animated backgrounds - including the Singapore skyline. By 'attaching' their photos onto the structure through media booths surrounding it, travellers become a part of Changi's media memory for ages to come. The well-heeled traveller isn't expected to trot around, especially in Japan. 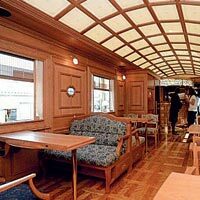 So, if your travels happen to take you to the East Asian island nation, be sure to check out Kyushu Railway's Nanatsuboshi - a rail service complete with a lounge car accommodating a piano and a bar, besides top-end dining and 14 private suites. Each wood-panelled bedroom has plush beds and a desk along with a luxurious ensuite bathroom. The train travels around Kyushu, with a four-day package costing up to $11,000 (Rs 6,79,221.98) per couple. But hey, don't rush for your cheque book yet - the train is fully booked till June 2014. Finally, the long-awaited feather in India's hat! Sikkim has emerged right on top of a list of 10 best destinations to visit, brought to you by Lonely Planet's Best in Travel 2014. 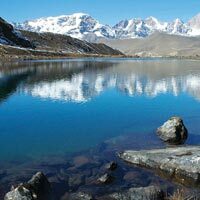 Australia's Kimberly region followed Sikkim - praised in terms of food and hospitality - in the list of best regions to visit. Paris was picked as the top city destination in another list that also included Cape Town, Shanghai and Chicago. The Greek Islands were seen as the best-value destination by the surveyors. Been spending a lot of time at your urban home, its foundations set deep and secure? Maybe it's time for a trip to the Suffolk countryside for a not-so-relaxing weekend spent in a balancing barn. Located on the edge of a wildlife nature reserve and overlooking a small lake, the 30-metre-long Balancing Barn for holidaymakers protrudes from a ridge, leaving half of the building seemingly afloat in midair. 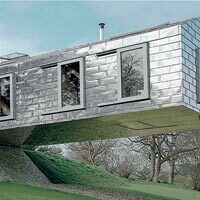 Designed by Dutch architectural firm MVRDV with the intention of making world-class architecture accessible to adventure-seeking tourists, the unconventional bungalow has exteriors clad in reflective metal tiles and a glass floor for viewing beneath the building. While the bungalow's kitchen equipment is provided by David Mellor Design, the artwork therein comes from Colchester and Ipswich museum in collaboration with the Huntington Collection. All yours to inhabit for »810 (Rs 79,790)! When was the last time you changed your password and user name for your frequent flier account? We don't blame you if the answer is "never"; you happen to be just one among the many who don't realise how important it is to safeguard these precious little assets. Frequent flier miles are like money, and there are many thieves and scam artistes who devote their time to stealing what is rightfully yours and spending them on flights, selling them, or using them for other nefarious purposes. So, every now and then, take some time off to change your password. 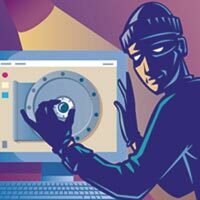 And yes, be extra vigilant if you open your account on a public computer.